Most days, sometime between waking and lunchtime, Robin will ask, “Is it a school day?” He lives life so fully in the present that clues such as dressing in his uniform of grey shorts and white polo shirt or watching tv for an hour after breakfast, aren’t compelling enough to answer the question for him. Walking with Gabe down the road, even in silence, is an insight into his personality. When he walks alongside you, he nudges and butts your side. His line veers into yours like a train track making repeated junctions. Ahead, he walks at a pace that leaves you shortening your stride to avoid his heels and ankles. And if behind, he bumps and clips your legs with his bag. There’s a need to have his presence acknowledged, to be reassured that you know he’s about. The infant school’s Got Talent show returns. Eliza has had the idea that she could perform a solo gymnastics routine. But that is a challenge to her shyness. So, Eliza has written L a note before going to bed asking for help being brave enough to do gymnastics at the show. L provides the support and all is set for next week. One day in our French holiday home, L posed the kids a question, and made it a challenge. ‘You have 30 seconds to say who you would marry, or I [Mummy] get killed’. Robin was first to declare – Anna, a guest at his birthday party. Eliza overcame her antipathy towards boys and followed quickly: Kai (he’s noisy, she explained afterwards and so was the first boy who came into her mind). Gabe, after several time extensions, and with the pressure mounting, refused to take part. He wasn’t going to have a girl associated with him, and anyway, it wasn’t real. Gabe and Eliza led an outbreak of creativity on holiday. They set out to write songs and perform in competition against each other. Eliza’s song, adapted from one sung at school, was ‘I am me’. She co-opted Robin into her group. With the song a wrap, she constructued a lectern from a cardboard banana crate so that her song-sheet could stay propped up in front of her. Gabe enlisted L and me to his team. He wrote a fully scored song about our campsite, with a sound effect bringing each line to an end, providing me with an active, but non-singing role. We were woken by a shock and awe thunderstorm at 1.45am in our stationary caravan in the South of France. Eliza came to find L and I. I went to see the boys in their room. Eliza followed as L’s wedding ring was too great a threat to her amidst the electric storm. All three kids were terrified. Eliza was shaking. Gabe wanted to know things we couldn’t answer – like when the onslaught would end. Robin alternated between peering captivated by the lightening flashes at the window, to cowering in his bed. Without stopping, the storm quietened enough for us to return to our beds after an hour. We woke before 8am, with it still rumbling around, and it continued until after lunchtime. Gabe ‘s greatest fear may be embarassment. He walked off the pitch, away from the game and disappeared after I upbraided in poor French a big lad, who had joined our game of football, for not passing to the little ones. Gabe walked across the campsite to L, complaining that I had humiliated him. 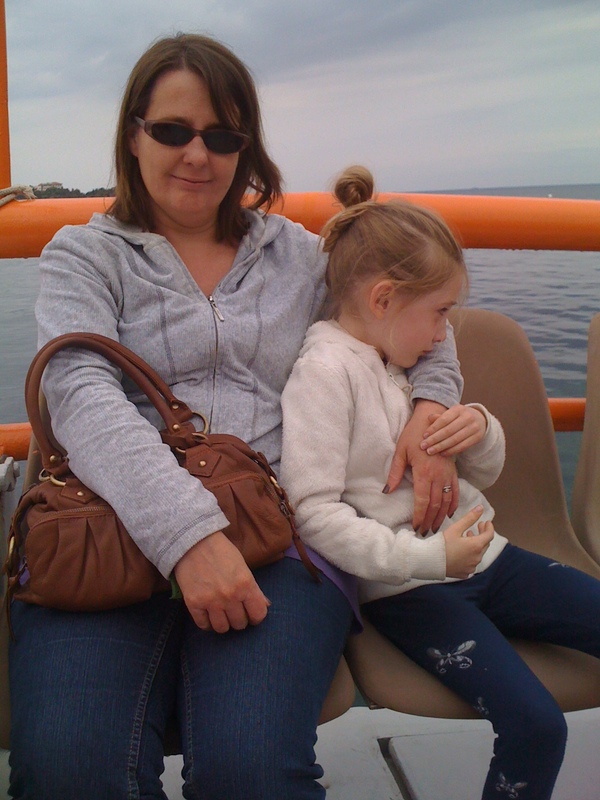 Eliza squealed with fear when we announced our plan to take a boat trip. She was coaxed aboard and clung to L. All this changed when the boat cut its motors at the edge of the Agay Bay and we were invited downstairs to the glass bottom viewing area. There, with fish swimming on either side, Eliza and her brothers chased around to get the best views, particularly when a barracuda came spearing through the fish. Robin was the first down the biggest slide in the pools. He skipped across rocks at the seaside. He played football amongst big boys and men, getting stuck in and at one point putting in a block tackle to stop a man’s shot, drawing gasps from players and the crowd, who may like me have expected to see a small, fractured ankle. But the first sight of the Grand Canyon of Verdun was too much and he needed a lot of consoling as we set out on the 25 mile drive along its southern rim.